A final bow for the two goofballs, Daniel J. Conroy and Jeff Prentky. Magnalux's latest comedy, written and directed by Dominick, wrapped early this morning down on the waterfront at Astoria Park. It concluded a weekend of restaurant scenes, blackbox theater sequences, and various wacky exteriors throughout the locales of NYC. The Producers with The Broccoli Boys at Under St. Marks Theatre in The Village. What a romantic vacation for Dan and Jeff. Dan's 90s-era Dad look proved to be quite fitting for him. The film is a zany yet legitimate study of friendship and creative partnership. So who better to produce it with than a bunch of our closest friends? Our wonderful production partners, (from top left) Nik Long, Hanan Miller, and Paul Sauline. 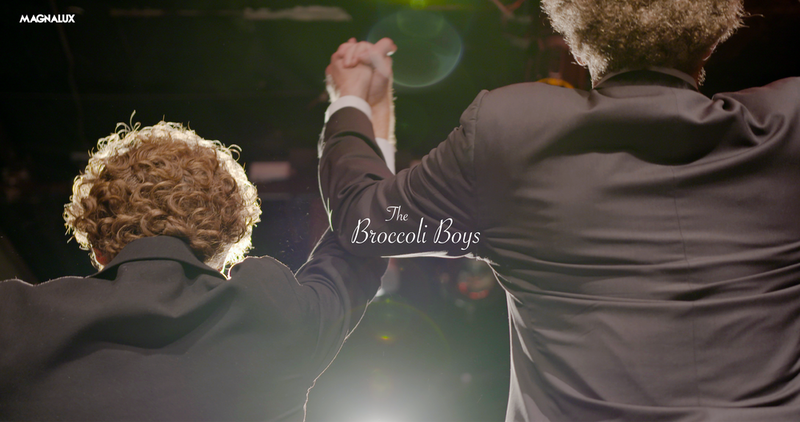 THE BROCCOLI BOYS is also our first to feature Adam's cinematography on his stunning new camera package, the Sony FS7. See the screengrab posterframe up top! We were very excited to welcome good friend and fellow filmmaker, David McElfresh to the set for a sweet little cameo. Stay tuned, production stills and trailers to come soon!